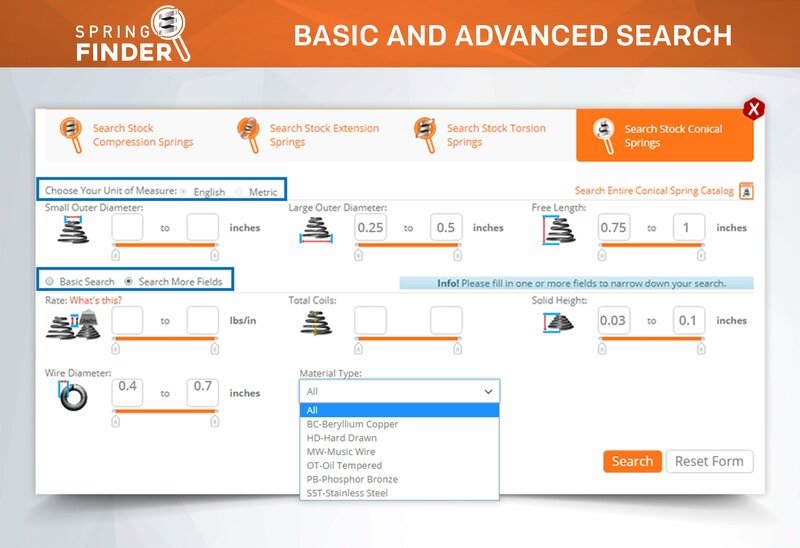 Definition: Spring finder, locator which helps you search and select stock compression coil springs using dimensions in the metric units of measurement. 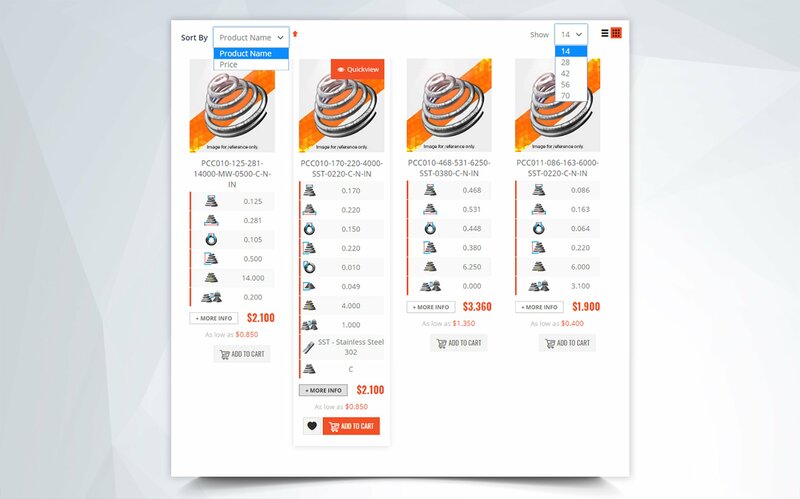 Our metric compression springs selector is an advanced tool optimized to give you the results you need. 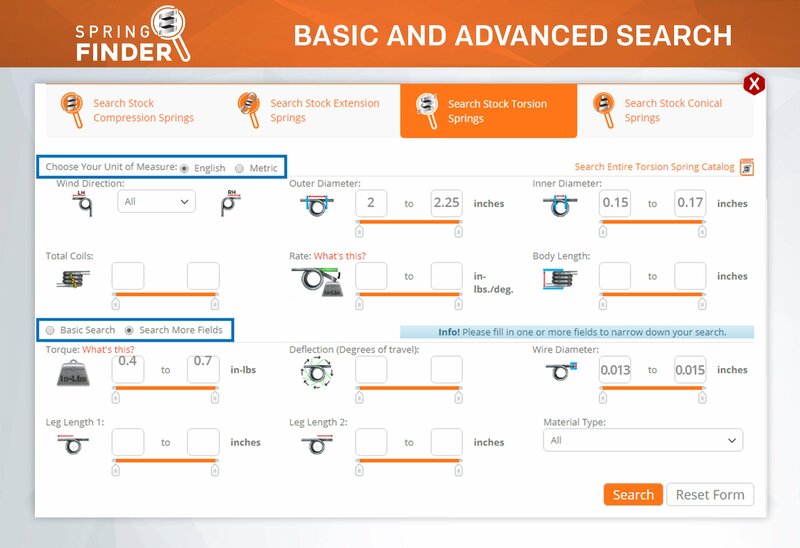 Input your spring dimensions in either the metric or english units of measurement. If you select metric, the measurements must be measured in millimeter (mm) units and the loads must be measured in newton (N) units. For rate, the metric unit of measurement is newtons per millimeter (N/mm). 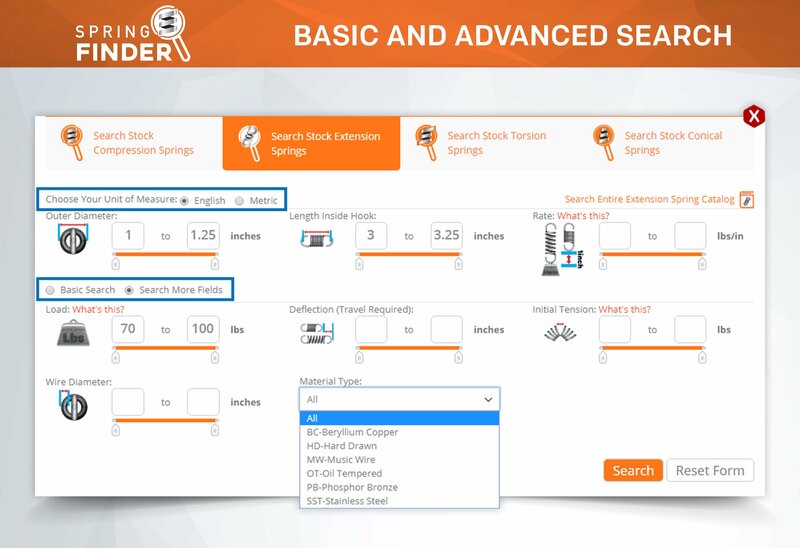 The Spring Search Finder allows you to decide which dimensions you want to base your search on. 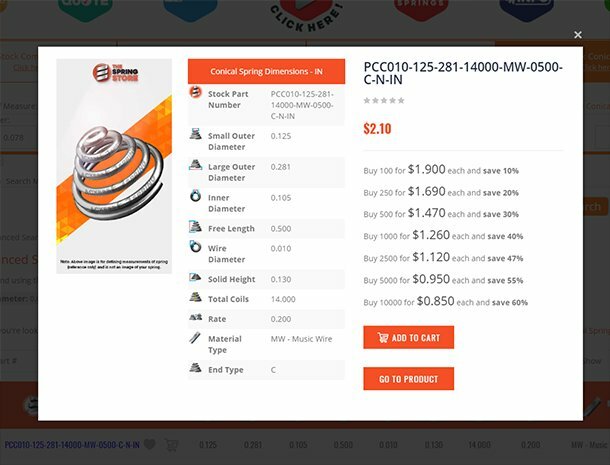 You may input your metric measurements by outer diameter, free length, spring rate, total coils, load, travel, inner diameter, and/or wire diameter. 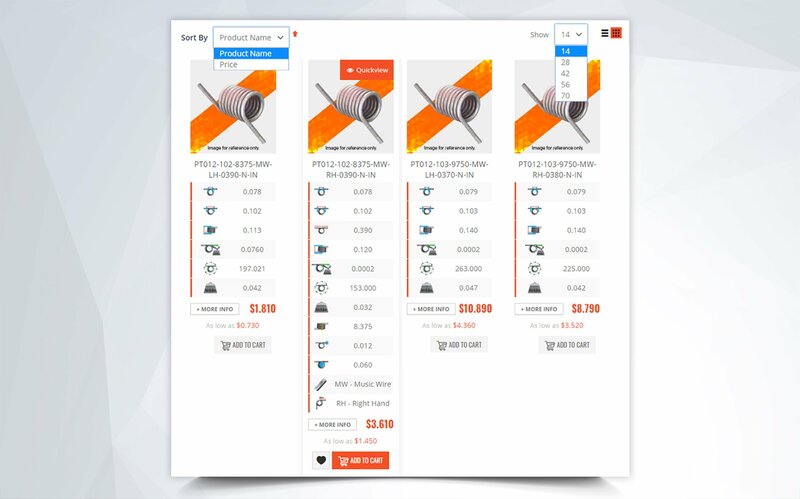 The option to select a specific material type will also be available. 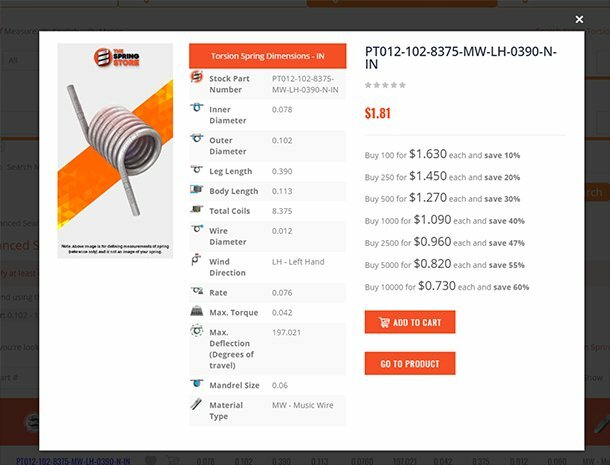 The material types provided are Music Wire, Hard Drawn, Berryllium Copper, Stainless Steel 302, Stainless Steel 17-7, Oil Tempered, Phosphor Bronze, and Chrome Silicon. 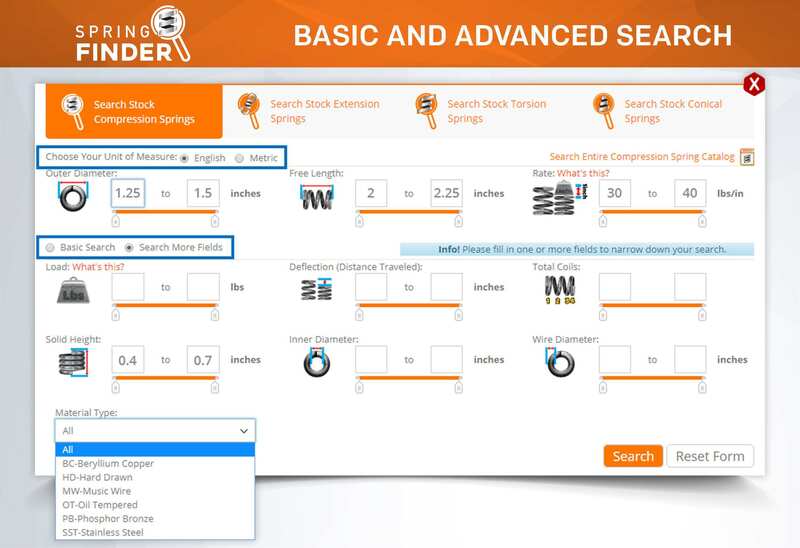 The metric compression spring dimensions are entered from minimum to maximum. 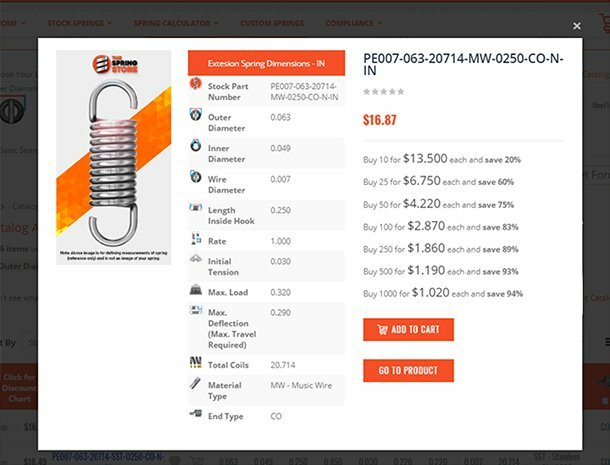 That way you decide which tolerances you choose to put on the compression spring design. 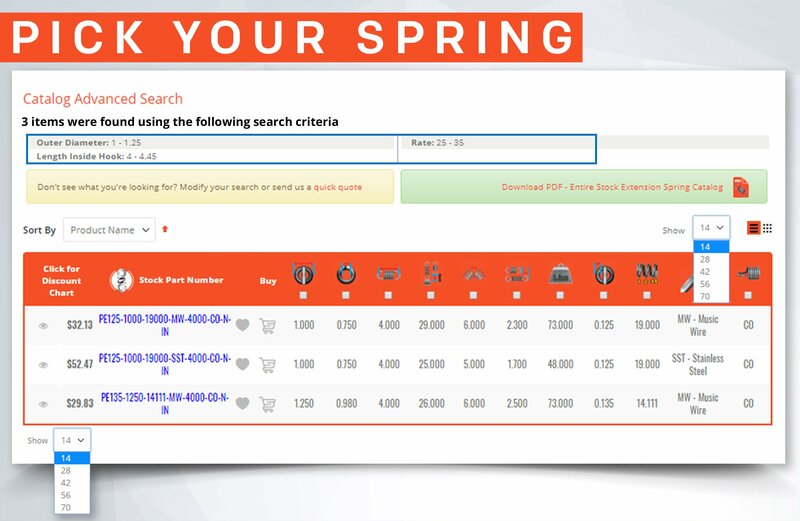 After filling out the Compression Spring Finder and clicking on Search, you will be provided with a list of all the standard springs that meet your requirements based on the metric measurements you entered. 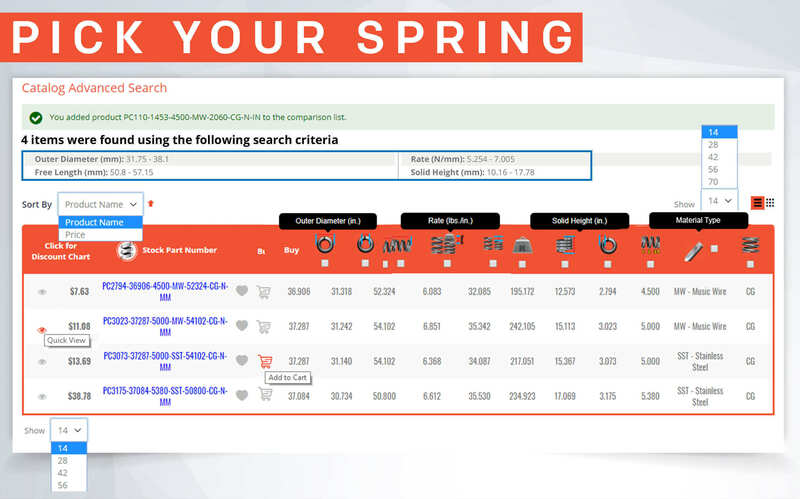 The fist column on the chart is the metric part number of the spring design meaning that the part number was generated using the springs dimensions in metric units of measurement. 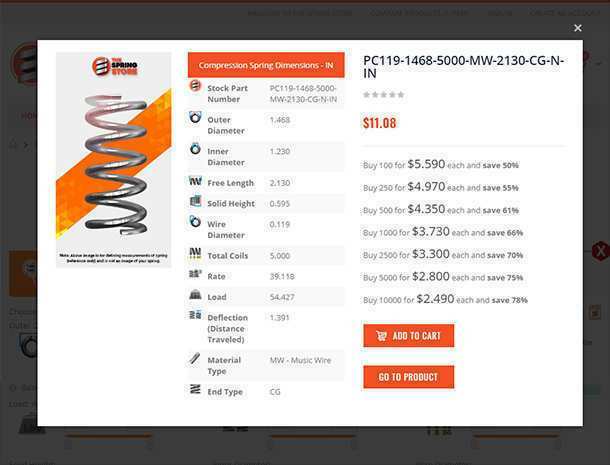 This is why the last part of the part number says MM instead of IN. 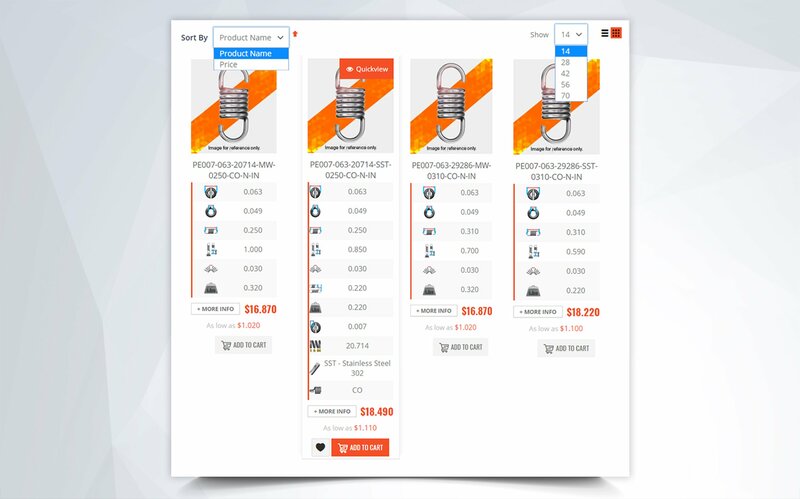 If the part number ends in IN it means that the dimensions are in inches (english units). The next column will be the spring price. 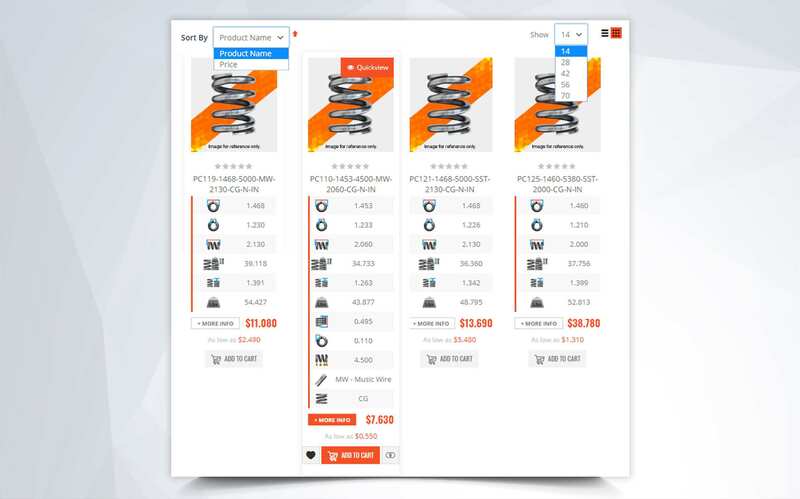 Click on a part number to see the price breakdowns and the quantity discounts. 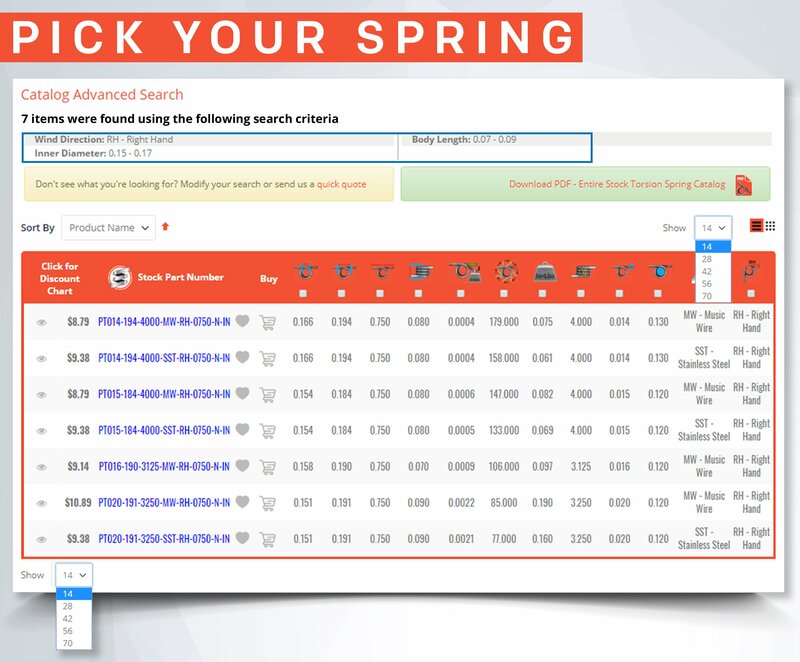 The larger the quantity you are planning to order, the lower the price of the spring. 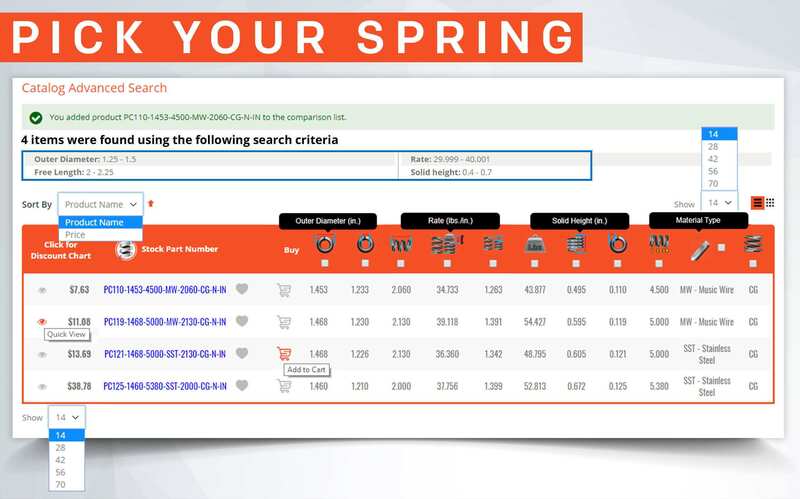 The remaining columns shows your springs specifications from physical dimensions to spring rate, maximum load, and maximum travel. 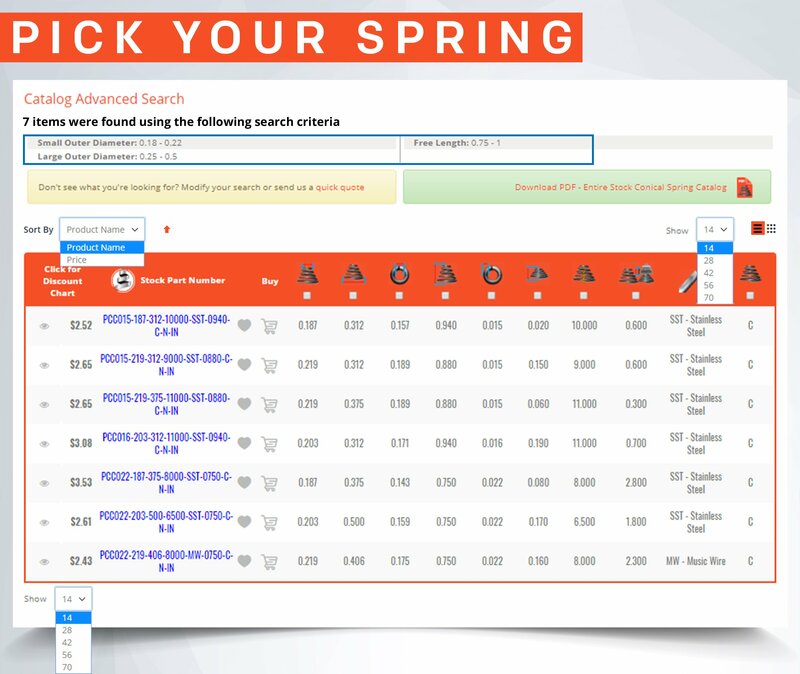 Take a look at the metric compression spring specifications so you can choose the ideal spring for you. Here you can see if the spring is strong enough, if it will travel the distance it is required to, and if it will meet your working loads. To calculate the working loads check for suggested max deflection (travel) and suggested max load follow the formulas provided in the examples below. If you have a spring with a spring rate (k) of 18 N/mm and it needs to travel (T) 5 millimeters, you must multiply both values together to find out how much load (L) is required to fulfill that distance traveled. If you have a spring with a spring rate (k) of 15 N/mm and you want to know how much it will travel (T) under a load (L) of 100 N, you must divide the load by the spring rate.